Before Buffalo chicken wings there was Beef on Weck, a great upstate New York tradition involving rare, hot, juicy roast beef on a salt- and caraway-encrusted hard roll. Here's the recipe for the rolls; the hot roast beef is up to you. 2 hrs 45 mins. to 2 hrs 48 mins. In a large mixing bowl, or in the bowl of an electric mixer, combine all of the ingredients except the topping, mixing to form a shaggy dough. Knead the dough, by hand or by machine, for 10 minutes. Allow it to rest for 10 minutes, then knead for an additional 10 minutes, until it's smooth and supple. Place the dough in a lightly greased bowl, cover the bowl, and allow it to rest for 1 hour; it'll become quite puffy, though it may not double in bulk. You may also use your bread machine, set on the Dough cycle, to prepare the dough to this point. 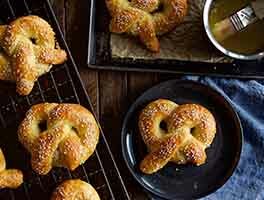 Divide the dough into six 3 1/4-ounce (92g) pieces, and shape them into smooth, slightly flattened rounds. Place them on a baking sheet, covered, to rise for 1 hour, or until they're good and puffy. While the rolls are rising, preheat the oven to 425°F. 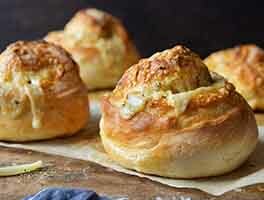 Brush the rolls with a bit of melted butter, and sprinkle lightly with the topping. Bake them for 15 to 18 minutes, or until they're golden brown. Remove from the oven and cool on a wire rack; they're best served the same day they're made, though they do reheat nicely. Freeze for up to 1 month. Disclaimer: I didn't have high gluten or potato flour, so just used all King Arthur bread flour. 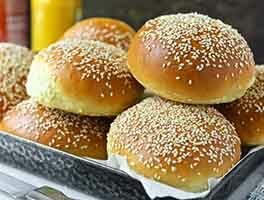 I have been buying Publix version of these rolls for some years when catering special events like Super Bowl parties. I was raised in Buffalo, so know well this wonderful "Beef on Weck" sandwich. Making a sticky dough is outside my comfort zone, but I followed the recipe closely and it turned out perfectly. The flavor was well beyond those I've been buying, so don't be timid about making these! As with all baking, weigh your ingredients and it will turn out just fine! To solve the problem of the topping not sticking to the roll, consider NOT brushing melted butter on the roll tops. Instead, spray a fine mist of water over the roll tops just before sprinkling the topping and placing the rolls in the oven. Halfway through baking, briefly remove the rolls and spray the roll tops once more. I've done this many times with good success, though not with this recipe. Thus my five-star rating means this recipe looks great and I will try it next time. I thought when I read the recipe that there seemed like an awfully lot of flour and dry ingredients compared to the amount of wet. It proved to be so, for me at least. I ended up having to add additional water while mixing. While the dough did rise, I wasn't happy with the end product. 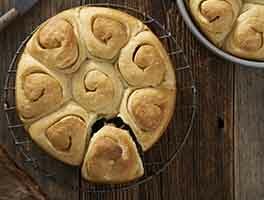 I will be trying a different recipe for Kummelweck rolls next time. I am sorry to hear of your difficulty. This may be related to the way you are measuring the flour. 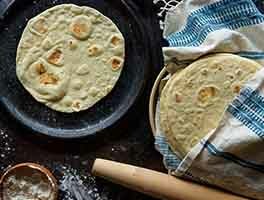 Here is the method we us in all of our recipes: http://www.kingarthurflour.com/recipe/measuring-flour.html Frank @ KAF. I make these rolls all the time because they are my absolute favorite. Everyone always loves them. I've tinkered a tiny bit with the ingredients over the years and find the dough very forgiving. I like to add a dried onion and onion powder to the mix to punch up the flavor. No longer authentic, but just wonderful! Made these yesterday using the types of flour suggested. I was a little worried, because I had forgotten to take butter out of the fridge beforehead, and so I zapped it in the microwave, and it was completely melted and still warm. But I was in a bit of a hurry. The kitchen was cold, so I put the rising dough in my oven and set a pan of hot water underneath it. For the first 40 minutes, it seemed, absolutely nothing was happening, and then just when I was thinking that I had killed the yeast with the warm butter, I saw the dough take off (rising). I shaped these into 6 rolls, flattened them a bit and set them on a baking sheet lined with parchment paper back in the oven with the pan of hot water underneath it. (I covered the rolls with a dish towel). They had puffed up so much after 40 minutes that I pulled them out of the oven, and set them on the stove while I preheated the oven. I didn't add any toppings. I just brushed them with melted butter before I put them in the oven. When I opened the oven door after about 15 minutes of baking, I couldn't believe my eyes. They were huge, at least 2 inches, probably closer to 3 inches high. They were a thing of beauty. My husband said these might be the best rolls I have ever made. We ate them with hot roast beef and gravy. As my husband said, "It doesn't get any better than this." P.S. I used a stand mixer with the dough hook to knead the dough, and really didn't pay attention to the instructions, because I was in such a hurry, so I only kneaded it for about 5 minutes like I normally do with bread doughs. Is 10 minutes of kneading, resting for 10 minutes, and then 10 more minutes of kneading really necessary? Made this recipe again with the KAF bread flour and SAF yeast, which I didn't have before. What a difference these ingredients made!! The rolls came out much larger and with a much better texture (and it wasn't exactly bad to begin with!). I also used an egg wash rather than melted butter on the tops, which resulted in much better adhesion of the topping. Disclaimer: I have never had beef on a weck, so I don't if this recipe produces "authentic" tasting rolls. That being said, the end result is a very tasty, dense yeast roll reminiscent of a Kaiser roll. I expected the texture to be a little more "open" and the exterior to be more crusty but was pleased with the outcome nonetheless. I used the Sir Lancelot but did not have the bread flour so substituted AP. I'm sure this affected the recipe (as well as the fact that I used grocery store yeast). I have ordered the SAF yeast and KAF bread flour and will try this again using these ingredients. Also had some trouble with the caraway and salt not adhering well. Not sure exactly how to remedy this, maybe press down gently before baking? 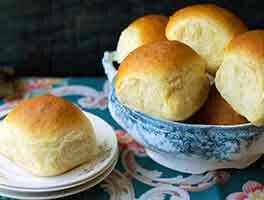 Bottom line...good recipe for sandwich rolls.